The Field Test Scale is a very compact design and provides accurate weighings of a wide variety of heavy materials, even under the most adverse conditions. Applications include: road constructions sites, weighing of soil samples, archaeological samples, and mineral samples. The Field Test Scale is ruggedly built and designed for field applications where accurate measurements must be made. The large stabilized pan will hold oversized samples without tipping, and the weighted base keeps the entire scale rock steady. 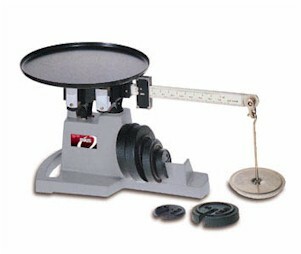 Model 2400-11 permits readings up to 500 g taken from a single sliding weight beam with a readability of 5 g. A set of slotted weights, stored in the base, extend the capacity up to 16 kg. Model 2400-12 has a capacity of 36 lb with a readability of 0.01 lb.